Scientists have figured out what causes pulsating auroras, a rarely seen form of northern lights in the night sky. And it was partly thanks to a lucky observation of the phenomenon in Canada. 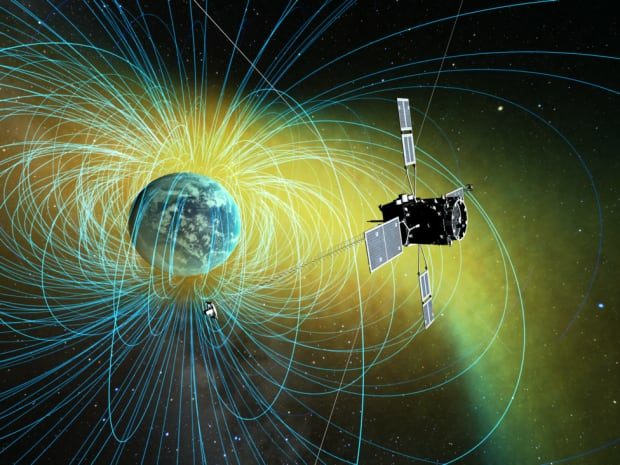 Waves in the plasma — a gas of charged particles — in the area of outer space surrounding Earth’s atmosphere called the magnetosphere. Levels of particles called electrons that can generate auroras. Then they tracked the particles to The Pas, Man., where an all-sky camera had captured images of the resulting pulsating aurora. The researchers obtained the data with the help of the Canadian Space Agency. Satoshi Kasahara, the University of Tokyo planetary scientist who led the study, and his colleagues compared the data from Earth and from space. They confirmed that pulsating auroras are generated when clumps of plasma waves in the magnetosphere, the region of space affected by the Earth’s magnetic field, intermittently herd and shove aurora-causing electrons into the Earth’s magnetic field lines. That causes bursts of electrons to rain down into the Earth’s atmosphere, where they can interact with particles there to produce a colourful light show. Normally, they just remain in space. The researchers published their findings today in the journal Nature. Many Canadians have been dazzled by the aurora borealis that they see as colourful curtains and ribbons of light that dance across the sky. Such “active” auroras are actually less common than blinking patches of light known as pulsating auroras, which can last all night, every night, said Allison Jaynes, a plasma and space physicist at the University of Iowa who was not involved in the new study, but wrote an analysis accompanying it in the journal Nature. Scientists already knew that active auroras happen when a blast of charged particles from the sun hits the Earth’s magnetic field. That causes the release of electrons that excite particles in the Earth’s upper atmosphere. Those particles light up when they “relax” back to a less excited state. But they had only a theory about what causes pulsating auroras — that they were the result of clumps of plasma waves called “chorus waves” (so named because they sound like birds chirping when converted into sound waves) interacting with electrons in the space surrounding Earth. It was a theory that had been proposed more than half a century ago, but never proven, Jaynes said. That’s because proving it required very precise measurements of both plasma and electrons in space that could be compared with measurements on Earth. Kasahara said he spent 10 years developing an electron analyzer that could take the space measurements. It was launched into space on Dec. 20, 2016 on board a Japanese spacecraft called Exploration of energization and Radiation in Geospace (ERG), nicknamed “Arase” after a river near Japan’s Uchinoura Space Centre. The satellite began taking measurements on March 23, 2017, and captured the plasma waves and electrons from the pulsating aurora in The Pas just four days later. Kasahara added that the new discovery may help researchers understand how the space environment and interaction between the sun and planetary magnetospheres affect planets’ atmospheres. Jaynes said the process that generates pulsating auroras transfers enormous amounts of energy from space into the Earth’s atmosphere. That could have a significant effect on things like ozone in the atmosphere or atmospheric circulation that generates phenomena like the polar vortex. Scientists don’t yet know how much of an effect it has, but knowing how this energy transfer occurs could help them figure that out. Such processes could also happen on Jupiter and Saturn, where chorus waves have also been detected, the researchers suggest.